Making his 41st career start off only nine days rest, Royal Albert Hall earned his first stakes victory capturing the inaugural running of the $100,000 Bernardini on Saturday at Aqueduct Racetrack. Breaking from post 6 with Junior Alvarado aboard, Royal Albert Hall tracked comfortably from sixth-position as 24-1 longshot Hit It Once More led the field of seven through a half-mile in 49.49 seconds and a mile and three-eighths in 1:43.40 on a the fast main-track. Alvarado began his winning move at the three-eighths pole, guiding Royal Albert Hall in prime position at the top of the stretch. Full of run, Royal Albert Hall overtook a valiant Hit It Once More in the final furlong and extended away to win by 1 ¾ lengths. The 7-year-old gelding completed 1 5/16 miles in a final time of 2:18.99. Returning $8.80 for a $2 win wager, the English-bred son of Royal Applause boosted his career earnings to $353,198 for owners Drawing Away Stable. 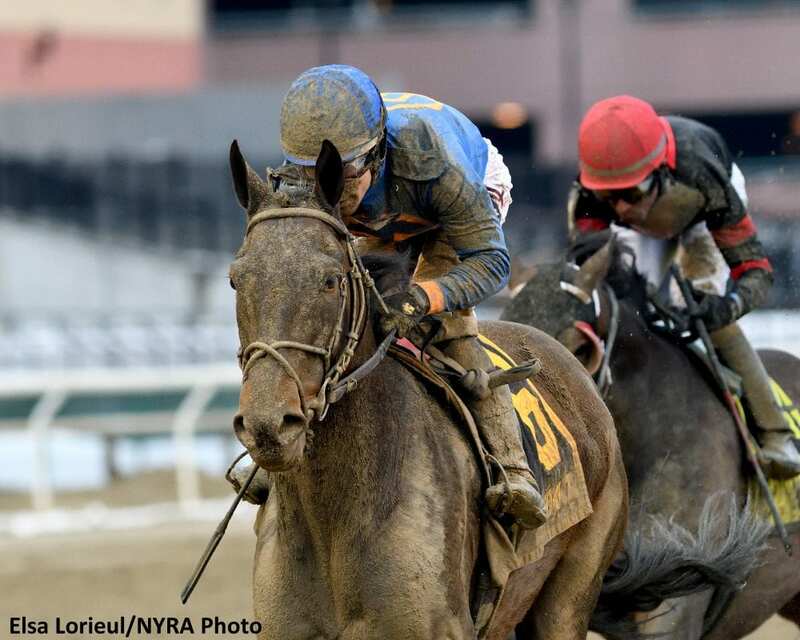 The victory provided trainer Rob Atras his first stakes win on the NYRA circuit. Following Hit It Once More in second was Shalako, Forewarned, Holiday Bonus, Leitone and Weather Wiz. Live racing returns Sunday at the Big A with an eight-race card. First post time is 12:50 p.m. A single-day Pick 6 carryover of $29,905.02 will start with Race 3 with a post time of approximately 1:55 p.m. This entry was posted in Racing and tagged aqueduct, Aqueduct Racetrack, bernardini stakes, Drawing Away Stable, Junior Alvarado, rob atras, Royal Albert Hall, royal applause by NYRA Press Office. Bookmark the permalink.